Look at this sad face. Isn't it pitiful? Last night, during wild war games with Bella and me.....I was the ref....Roxy managed to hurt her back paw. So it was a quick trip to the V.E.T.S. (We think Roxy is going for the Oscar with her Pitiful Pup Performance). Nothing broken, the vet thinks she may have stretched a ligament or something similar to a football injury. And she came away with some anti-inflammatory tablets. The vet said she isn't to go on walks or anything for TWO weeks and we have to keep try to keep her quiet. (Like that's going to happen). This morning, it's back to war games. She'll have to miss the 6 a.m. walk. That's not going to go down well. But, we'll try to keep her quiet. On a sad note..when we left the vets there was a 6-month old puppy brought in with Parvo. Why don't people vaccinate their pups? Adding a new pup to the pack has caused us to make some adjustments. One of the biggest..
is Velcro Dog. As scotties, we love being in the same room, near each other, but we do not cuddle. Roxy always has to be curled up against someone or some dog, usually Bella, --we think it's a Bull Terrier thing.. It is an adjustment we've all had to make. She also kisses us all the time. Kendra is well. She has come out to go on walks and has her own private walk around the front garden and down the street. She's eating well and barking at people...even if it takes her a little longer to realise that someone's there. 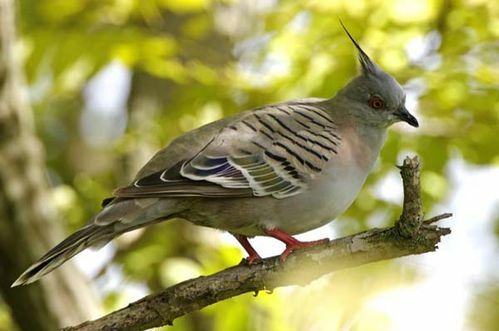 Today we want to show you some birds we see often, but don't usually chase. Yesterdays birds wait until we're very close then fly off a short distance, so we can chase them again. We have a few Black Swans at the duck pond. They head for the water when they see us coming. 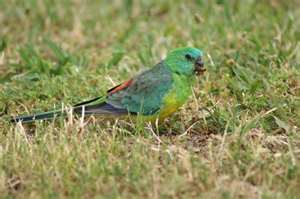 The little Red Rumped Parrots usually feed on lawns, but they're too quick for us. So are the little Faery Wrens. 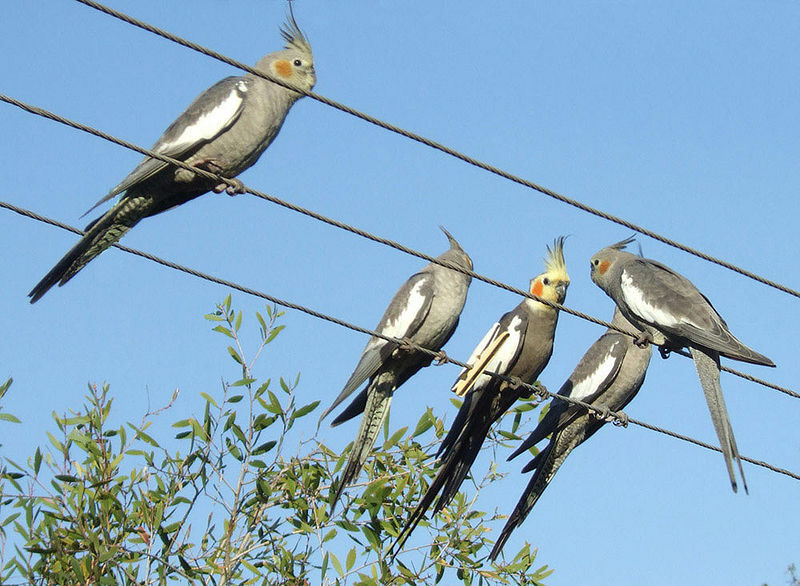 Cockatiels are usually in the trees, so we can't chase those. 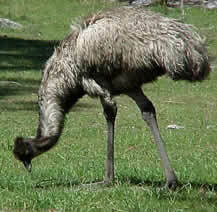 Emus we've only seen from the car...they're way too big to chase! There are lots of other birds we chase like sparrows, black birds, Indian mynahs, Australian Miners, Honeyeaters....just loads. We always chase anything that comes into our garden. SHE has planted all native plants to attract the birds and we chase them away...BOL! 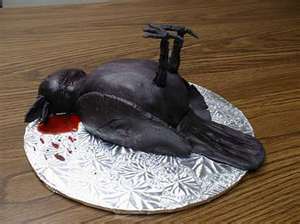 Oh, Bella wanted to share her favourite cake with you--again! To everyone who is celebrating Thanksgiving....have a fantastic time with your families and friends, and if you're travelling, be safe! Today we're showing our top birds for chasing. 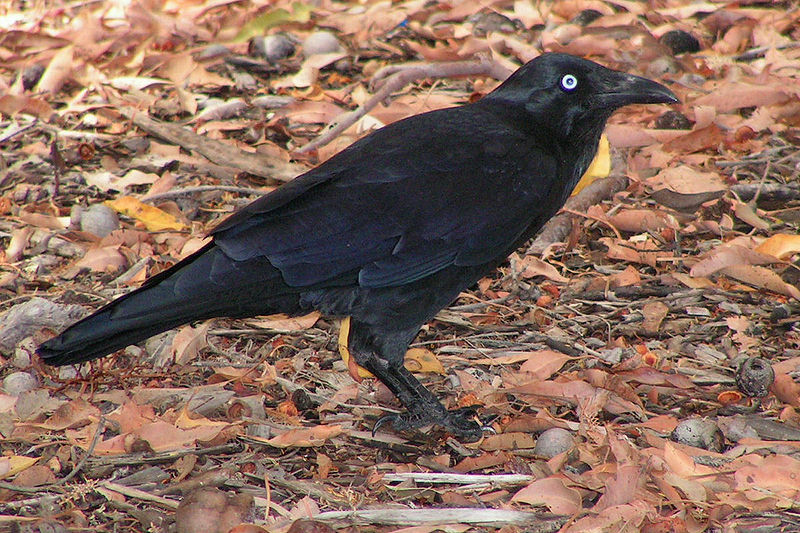 Number 1 on our hit list are ravens, crows or currawongs.....any of these large, black birds. We always go after them--they tease us! 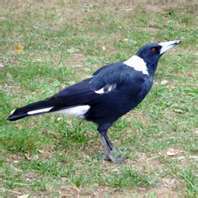 Magpies are great to chase except during nesting time when they chase us--and everyone else. 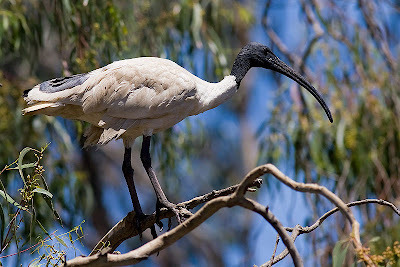 Ibis--scavenger birds. They're very common. 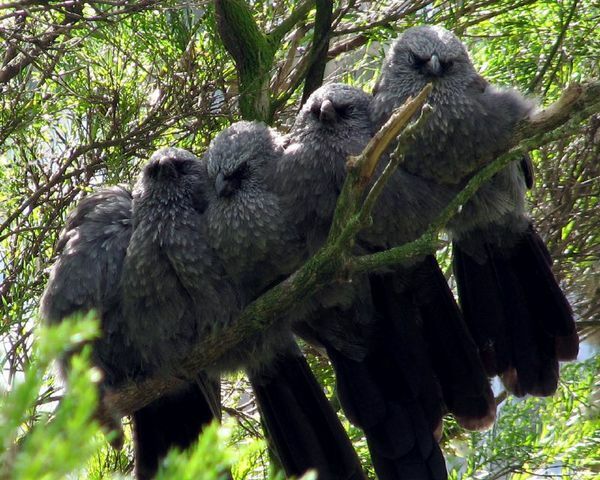 Apostle birds--a family lives near the local school. 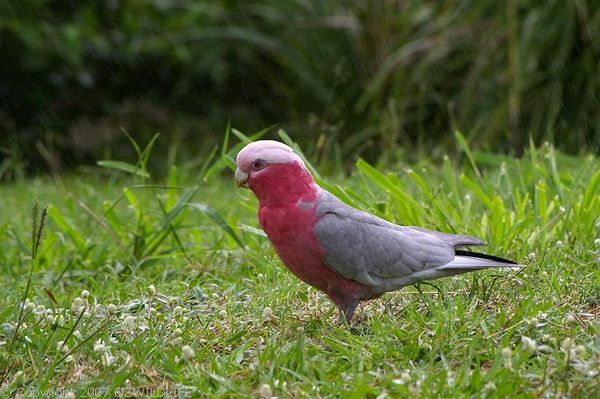 Galahs are the most common. Huge flocks feed on the grass at the local sports field. It's fun to make them fly away. 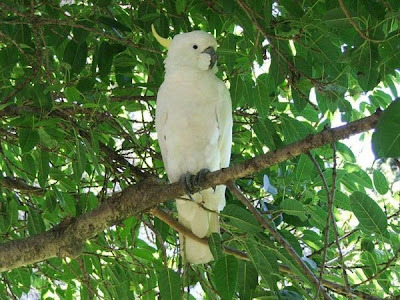 The cockatoos. They're sometimes in low bushes or amongst the galahs. Even Roxy is an accomplished bird chaser. Kendra didn't want to eat this morning--not even her tablet wrapped in cheese. We tried peanut butter, but she wasn't interested. The Milko came and went without any noise. She just curled up on the concrete and refused to move. Again, we wondered if it was time. But we're happy to report that by lunch, she ate some chicken and barked at a family walking past the house! Then ate a normal meal for dinner. We 're joining Sarge and the others in Blogville 'Giving the Bird'. We thought we'd start with the Kookaburra. This is the sound that accompanies us on our early morning walks! The Home Care ladies arrive to help the elderly lady across the street. Kendra sounds the alarm. Today is the day we tell Roxy's foster mother whether Roxy has found her forever home. We got up early and went to the river--the other dogs were already there. Bella and I (Daisy) went swimming. Roxy doesn't like the water......yet. This is a picture of the sand we bring home....it's for Gail and Bertie because they always ask about it. When we got home, we had baths and then later, bones. We e-mailed Lea. Roxy has found her forever home with us! Lea will send the official adoption papers to us this week. Roxy is indeed a Bull Terrier/Rhodesian Ridgeback. Yes, those are the modified sandals! Yesterday we had our first HOT day......37 C (98.6). See Roxy's pink(ish) nose? That's zinc. She has to have sunscreen put on her nose so she doesn't get skin cancer. We've never had a dog that needs sunscreen before! SHE was working yesterday and had to come home at Morning Tea (Australian schools have a morning tea break) because SHE forgot to put the zinc on Roxy's nose in the morning. Didn't take Roxy long to find a prime sleeping place. Yesterday morning was beautiful, so we sat outside with HER while SHE had her coffee and read the paper. Later when we went inside, Kendra stayed out--she loves to be out there so she can bark at people and watch what's happening in the street. After a while, Kendra started making a crying sort of bark. We rushed out to see what was wrong. 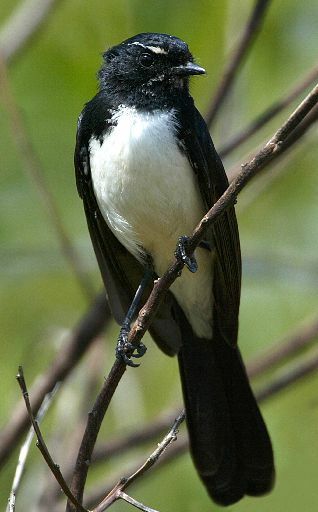 It was a baby bird. We watched it for a while but left it alone because the last one SHE tried to nurture died in about 20 minutes. Anyway, we're happy to report that we saw it this morning, still in the bush, but with it's parents! Now, all of you can attest to the difficulties of training humans. Kendra, Bella and I have all had a turn as puppies to train HER. And we haven't done too badly. I, Daisy, did a sterling job teaching HER to hide cables....especially telephone wires. I had to chew through a few for HER to finally get the idea. And many of you will remember Cyclone Bella. She taught HER not to leave around library books...or any books, cardboard, photo albums.....or shoes. SHE was upset when SHE left her favourite Birkenstocks ON THE FLOOR and found the strap chewed through. SHE especially loved those sandals because SHE bought them in Germany conducting the whole transaction in GERMAN! And was told SHE spoke it well! We think the sales ladies were just kind. 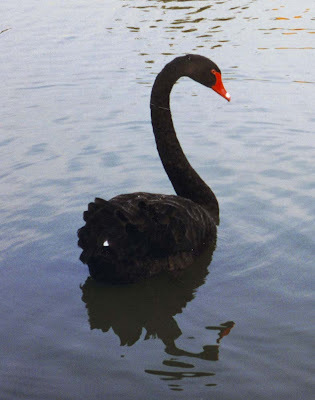 In fact, SHE loved them so much, SHE refused to throw them out resulting HER travelling from Dubbo to Virginia (3 flights) before SHE noticed that she was wearing one blue and one black one!!! SHE eventually replaced them at great expense and one would have thought SHE'd learned a lesson. Enter Roxy.....who had to train HER again. However, this time SHE decided to modify the sandals 'cause duck tape wouldn't work. BOL! We're naming this new style 'The Roxy'. Bella inspects the new style while Roxy tries to make off with the other for further modification. Training humans is an uphill battle. Kendra enjoying a roll yesterday at our friend Millie's. Her stomach is bare because of the ultrasounds. You know last Saturday when I went to the 'The Dish'? Well, I went to meet Roxy. One of the dogs we featured in our 'Rescue Me' post. 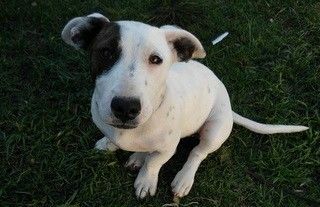 We'd been looking for another dog to join the pack for ages...a miniature Bull Terrier. BUT we were aware of dogs who need homes. Every time we looked at pups, Roxy was there looking back at us. We'd been looking at her for a few months and we decided to offer her a home. We started negotiations about two weeks ago--before Kendra became unwell. We drove for 2 hours south and Roxy and her Foster Mum drove 2 hours north and we met in a park. Roxy came home with us for a two week trial. Kendra on a slow walk in the front garden. Kendra Update: This morning Kendra came to the front gate ready for the early morning walk. She can't go on our long, fast walks, so she was allowed to walk in the front garden where she immediately found the skeletal remains of a bird that SHE'd forgotten about and nearly had an extra snack! As you know Kendra was not well on Sunday. She wasn't interested in food--definitely not typical and just found places outside on concrete to lie on. A quick look at her gums showed they were so pale, they were almost white and her stomach was distended. After a quick phone call to the vet on duty, we took her in. She looked pathetic. Not moving. Her tumour was bleeding into her abdomen. Basically, the choices were to take her home; admit her to hospital--to be placed on a drip--or help to cross the bridge. We opted for the hospital to see what would happen. Monday night did not go well, (she is taking pain killers) and the last option looked like a possibiltiy. SHE had to work on Monday, but came home during lunch to check. Kendra was showing a bit of interest, ate and wobbled around a bit. Again, the decision was put on the back burner. Tuesday and Wednesday showed improvement. The Dr said that these bleeds can happen at any time, can clot thus allowing her to feel well. This morning, she came out quite perky to have breakfast, managed the two steps to get outside, and raised hell at some kids who dared walk passed her house. As her main interests in life have been FOOD and BARKING at pedestrians, her quality of life is restored! Kendra has always hated being away from home unless it's the kennels. We think she just wants to be at home. So that is the way it is at the moment. the Power of the Paw in Action! !